“Organic” is a huge buzz word these days at grocery stores and farmer’s markets. But getting to see it up close and personal is a lot of fun and very interesting. That’s exactly what I got to do at the Daybreak Mill, just out side of Estevan, SK. I connected with Nicole Davis, owner and proprietor, earlier in the year and she jumped on board with my project. When I first met Nicole, I was a little bit awestruck. First of all, she didn’t fit my mental image of a farmer (a picture a guy, 50+ in a plaid shirt, jeans and a mesh farm implement ball cap). 🙂 Nope, I was greeted by this beautiful, 20 something blonde girl who just happened to own and operate an organic mill. 😎 After our introductions, she toured me around the facility explaining about the various processes from cleaning the grain, to grinding it to selling it in the office. 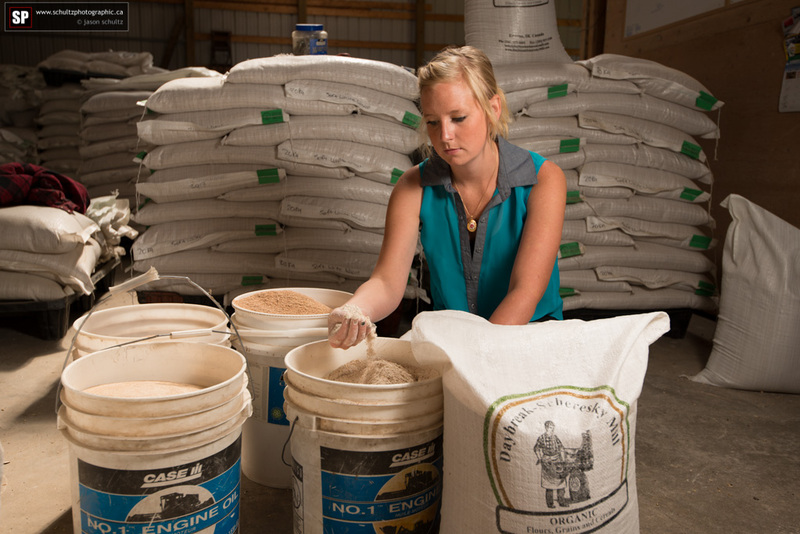 For Nicole, organic farming is in her blood. Her father was and is an organic guy too, so she comes by it naturally. But the more people actually consider organic food, the more appealing it becomes. Most people are aware of the chemicals that are used to spray crops for pest or weed control in traditional farming. But lately, it is the genetic changes are raising more alarm in people’s minds, as well as their bodies. Suddenly everything these days is “gluten-free”. But nobody very few people had gluten allergies/intolerances years ago. So what changed? Organic people will argue that the food itself has been changed, either by selective breeding of the crops or more recently, genetic modification. It is causing problems for more and more people, especially the GMO stuff that can be found in almost all processed foods. As people become more aware of these changes, the market is responding. 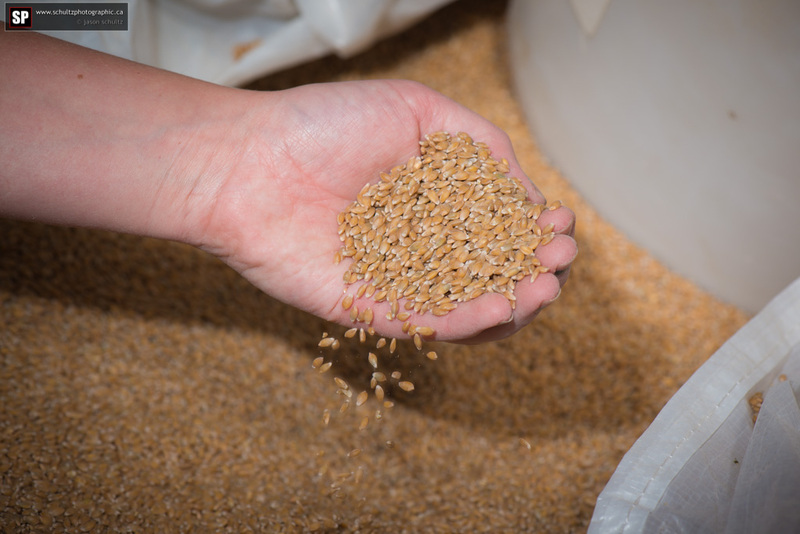 Demand for Organic grain is increasing nation wide. 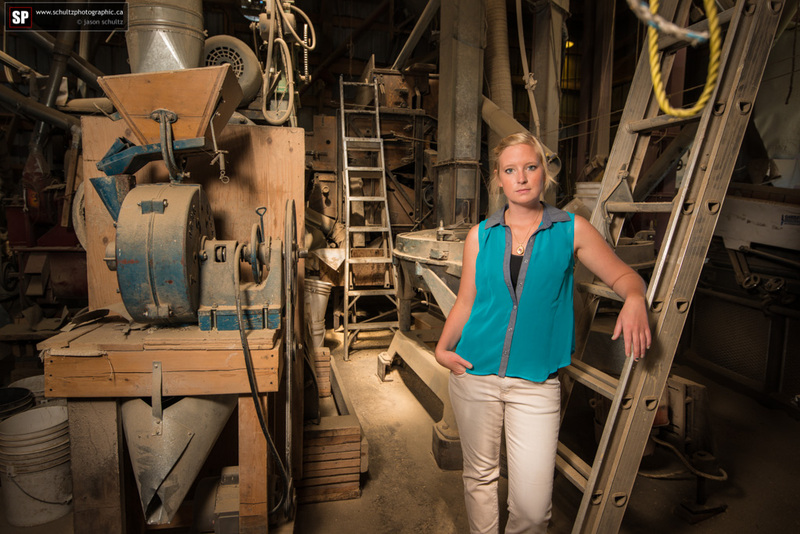 Nicole’s Daybreak Mill ships product across the country. And product they have! When we think of grain, the average person thinks of ‘wheat’. But there are so many different kinds available! Einkorn, Emmer, Spelt, Red Fife, etc. all of which are available for sale the Day Break Mill. In fact, Einkorn is the oldest grain that was farmed by humans some 10,000 years ago. It is still being grown today. And it is delicious! Nicole gave me a sample of some. We cooked it up like you would rice and ate it as a side dish. It actually felt neat knowing that I was eating food that has been unchanged for thousands of years! But then again, I’m a sucker for tradition. 😎 Their organic granola and pancake mix is delightful too, our kids gobbled them up! I can’t say enough good about Nicole and her team at Daybreak. They are all tremendous people who really love and care about what they are doing. They are passionate about Organic farming and the products they sell. And, as the market demand grows, you can find their products in more and more places all over Canada. But you can also buy direct from their mill too – which I encourage everyone to do, especially if you live in SE Saskatchewan. 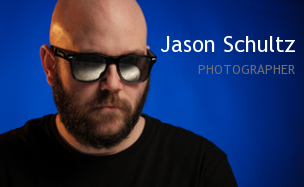 This entry was posted on August 29, 2013 by schultzphotographic. It was filed under Organic and was tagged with Alvin Scheresky, Beinfait, Daybreak Mill, Estevan, Grain cleaning, growing, milling, Nicole Davis, Organic Farming, organic grain, Organic Mill, Organics, Personal Photography Project, Saskatchewan. I have nothing against organic production or consumption but here are some more facts about whether or not it is better for you. What do you have for Gluten free products available, I have bought your millet; however don’t see it on your website. 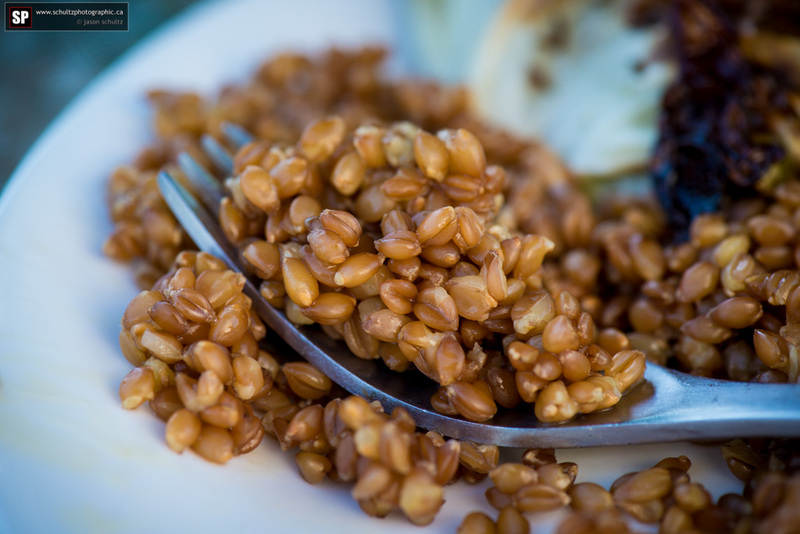 Do you have any other grains that are gluten free such as Quinoa, brown rice , teff, etc. You will have to contact Daybreak directly.